Government has reached final agreements with the India Export-Import (EXIM) Bank for the take-off of financing arrangements to improve agricultural mechanization services in farming communities across the country, and provide water for the inhabitants of Yendi and its surrounding towns and villages. This was made known after a meeting between officials of EXIM Bank of India, led by its President, Mr. David Raaquinha, and a Ghanaian delegation led by the Vice President of the Republic, Dr. Mahamudu Bawumia, on the sidelines of the ongoing 14th CII-EXIM Bank Conclave on India-Africa Partnership Project in New Delhi, India. Following a visit by H.E. President Nana Addo Dankwa Akufo-Addo to India last year, discussions were opened on the possibility of financing agreements between the Government of Ghana and EXIM Bank of India for a $150 million credit facility to finance the strengthening of Agriculture mechanization services in Ghana, and a further $30 million facility for the Yendi Water Project. Legislative approval for the two deals have since been passed by Parliament. At a closed door meeting between Vice President Bawumia and officials of India EXIM Bank on Monday 18th March, 2019, all final discussions for the take-off of the two projects were sealed with final sign off set for next month. The agriculture mechanization project is expected to provide equipment and training for the various Agriculture Mechanization Services Equipment Centers (AMSEC) across the country, while the Yendi Water Project will provide water to the over 133,000 residents of the Yendi Municipality and the surrounding towns and villages who contribute to the agriculture sector through the production of food and cash crops on a large scale. 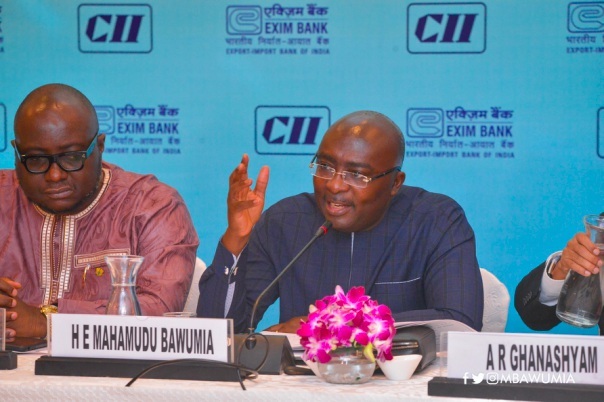 Vice President Bawumia expressed satisfaction at the commitments and assistance offered by the EXIM Bank of India and the Government of India to Ghana over the years, and pledged enhanced friendship and cooperation between the two countries. Earlier, Dr. Bawumia had an interactive meeting with leaders and captains of industries in India, where he took the opportunity, together with the key stakeholders in Ghana’s investment drive, to showcase the Ghana Project and what Government is doing to create an investor-friendly environment conducive for business to thrive. Leaders of Indian-owned companies already operating in Ghana also took the opportunity to tell the Ghana story, while providing crucial feedback on ways to make the business environment even better.